On the weekend of August 4-7 2017, GKR Karate held the 9th GKR Karate World Cup at the Coomera Indoor Sports Centre on the Gold Coast. This record breaking event was set up to raise funds and awareness for the Chris O’Brien Lifehouse, an integrated and focused centre of excellence, offering everything a cancer patient needs in one place, including advanced onco-surgery, chemotherapy, radiation therapy, clinical trials, research, education, complementary therapies and psychosocial support. Shihan Glenn’s World Record Attempt was up first as the huge team of GKR Karate volunteers set up the boards for Glenn to break in his World Record Attempt. After taking a moment to gather his thoughts and compose himself for what was ahead, Glenn raised his hand signalling for the the Guinness World Record Official to begin the countdown…..
As you can see – Shihan Glenn put in an absolutely phenomenal effort resulting in setting a Guinness World Record for ‘fastest time to break 1000 pine boards’ at 10 minutes and 10 seconds. Congratulations Glenn on securing another record!! With the opportunity to make history whilst supporting a worthwhile charity at hand, the GKR Karate International family responded in their droves to attempt to break the current record, which was previously 204. Well over 400 people registered to take part in the the attempt which was governed by strict conditions set by the Guinness World Records team who had an official representative on hand to ensure the legitimacy of the attempt. With all the students in place and the instructions give, the official countdown began…. After the official count was made, the record was set at 433 boards broken, more than double the previous record! 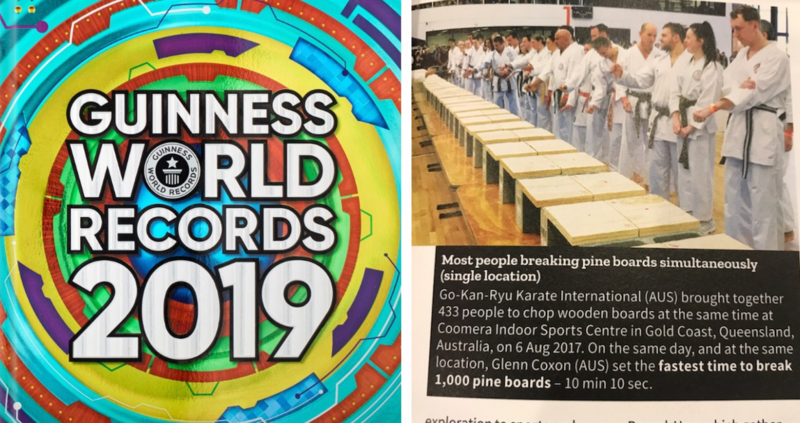 The 2019 Guinness World Record book has recently been released and we are excited to say that our records made the print edition as you can see below. It’s a testament to the power of the GKR Karate community that we were able to pull together to break 2 World Records in the one morning all in the name of raising funds for cancer research, it is something that each and every person involved should be very proud of!